Mason Covington, left, and Tyler Duke with a car seat outfitted with the Baby Saver 2000, which they have patented. Tyler and Mason were challenged by Tate Rector, their teacher in a robotics and engineering class at Beebe (Ark.) Junior High School for the 2016-17 school year, to enter a competition that asked them to solve a real-world problem. The boys' research uncovered that on average 40 babies die annually from being left in hot cars. "We kinda thought, this is 2017; we definitely have the technology to solve this problem, so let's do it," Covington said. 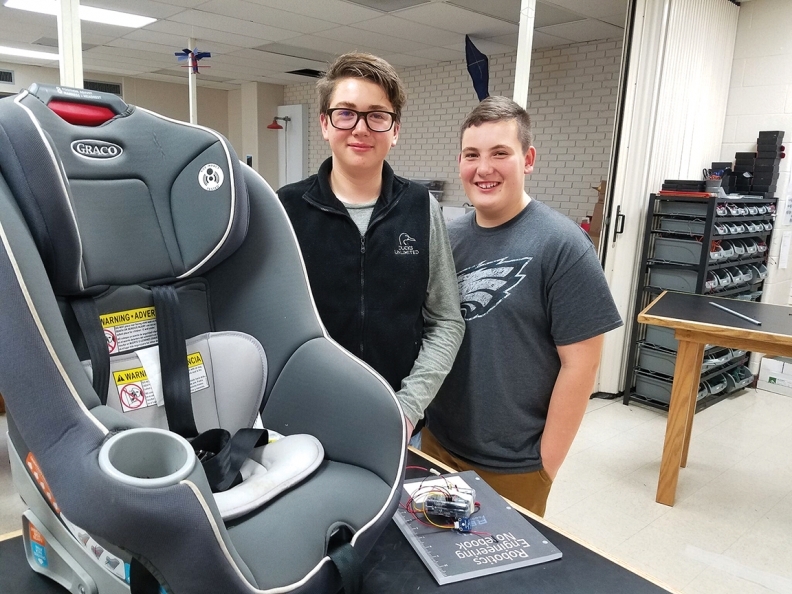 The boys invented the Baby Saver 2000, a device that attaches to any car seat and registers the weight in the seat and the temperature in the car. If the car goes over a set temperature, a sensor in the key fob engages the panic button alerting the driver. The award was presented to the young inventors at the Arkansas Children's Forum, an annual meeting hosted by the Arkansas Children's Foundation. Arkansas Children's also presented the boys with a $10,000 check from the Jonathan M. Bates Center, an endowment dedicated to improving the lives of Arkansas children. The funds will help get the product to market. The pair were also among the 10 finalist teams in the 2017 Samsung Solve for Tomorrow competition. "Innovation is essential in order to leapfrog to the next level of care and achieve better health outcomes for children," said Dr. Jay Deshpande, chief medical officer at Arkansas Children's Hospital, Little Rock. "These young men identified a problem that is a public health issue, discovered an intervention and then worked diligently to find a solution."